To follow up Brandon's post from yesterday regarding employer owned life insurance (EOLI) and so called Dead Peasant Insurance as it's been described in the media, I thought I'd share a piece recently written over at Forbes. We think this sort of reporting is pretty typical of the insider media mantra, “if it bleeds it leads”. You should really take a few minutes to read the piece and form your own opinions, however, it quickly became apparent to me that the journalist is really huffing and puffing about nothing in this case. Yes, it's true that the Pension Protection Act of 2006 did place some definite guidelines on “Dead Peasant Insurance”, I would say it's hardly the big problem the folks over at Forbes are making it out to be. Basically, if you're an employer and you want to purchase life insurance on an employee, you actually have to let the employee know and have their written consent to do so. And make sure that the notice of consent is signed and dated BEFORE the policy is issued. If the consent is given after the fact, it's no good. That's about as complicated as writing up a bill of sale for your old Geo you sold on Craigslist. I've been an insurance agent since 2000 and worked on a number of business insurance planning cases during that time and I've never once encountered an instance where an employer was doing all this behind the scenes–hidden from the employee that was being insured. Not saying it didn't happen but it's just not the “crisis” that the news media would have you believe. Most business owners are very honest, trustworthy people who value their employees and the relationship they have with them, which is why they are seeking to insure their lives. A good employee is an asset to an employer. And in many cases EOLI is done to both protect the business from the loss of an asset and their is a benefit to the employee's family as well. Now, I shouldn't forget to mention this. There is one more requirement that you, the business owner has to complete every tax year in regard to the rule changes in 2006 for EOLI. 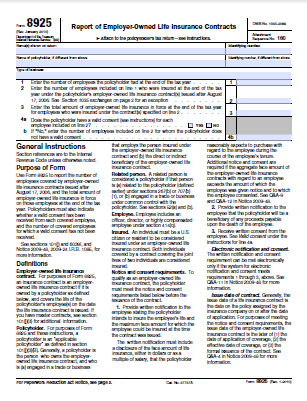 You have to file Form 8925 with the IRS every year, I've posted it here for to see how complicated this is. I'd say in terms of all the various IRS forms that most of us come in contact with…this one is pretty benign. It ranks in sophistication along side a W-9 in my opinion. If you'd like some help navigating the bloody waters of dead peasant insurance or any other of your life insurance questions, please feel free to reach out to us–we'd be glad to help.